Filled to the brim with foot-twisting shuffly beats and wonky melodics, ‘Let It Go’ is Argentinian-born electronic music producer Nehuen’s debut release for Barcelona’s bass-fetishist Disboot label. In this three track EP, Nehuen fuses winding rhythms for your hips with lopey, drunken synths for your head. Swinging like a smoked-out monkey between UK Funky, Dubstep and Hip Hop, Nehuen’s diverse influences shine through each song, while maintaining his signature sound stamp that has left its undeniable mark on sound systems worldwide. 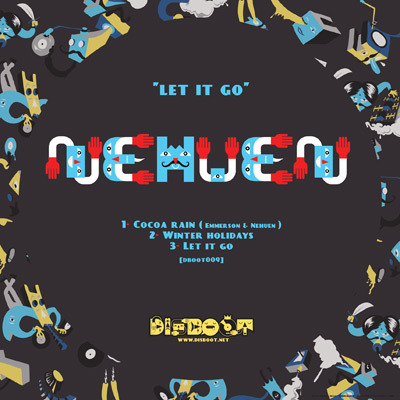 ‘Cocoa Rain’, co-produced by fellow Barcelonan, Emmerson, is the EP’s opening track, nodding its head respectfully to the emerging UK Funky sound, while taking cowbells, grimey bass and chopped vocals along for the ride on its irresistible bounce. Continuing in a more post-house oriented sound, ‘Winter Holidays’ brings tribal drums to the forefront of its forward march, placing pummeling african percussion atop face screwing sub bass and airy, dreamlike synth pads. If the first two tracks are designed for ultimate club sub bass destruction, then the EP’s final track, ‘Let it Go’ is the definitive soundtrack to the wind-down after party. Its hydroponic sub bass lopes around a lazy hip hop beat, with bit crushed melodic arpeggiation providing the head nodding drive that will have you exhaling that last puff with a warm, knowing smile.